New floors, painted walls, brand spankin’ new bed, and our bedroom is finally finished after a couple months of semi-hard work. Let’s take a tour, shall we? First things first: I ripped up the carpet and laid new (plywood) flooring. You can check out the how-to here. I also gave the walls three much needed coats of paint; the shade I used was Polar Bear (Behr). The floor has been down for about two months now and it is holding up really, really well. My dogs are not soft of foot and it takes a beating on the regular, but it still looks great and feels awesome under my (always) bare feet. You can read all about how they’ve held up over the past year here. I could not wait to get rid of the ceiling fan — which was a bit of battle. For someone who has never once turned on the ceiling fan or expressed any interest in ceiling fans, Matt really went to bat for that thing. However, once we got it down and switched it out for my awesome retro thrift-store find, he conceded that it was in fact way, way better. BARF. Would you look at that sad sack of a bookshelf? I really needed an inexpensive solution that would hide the TV and beautify the entire thing at the same time, so I built a cabinet top out of plywood using my Kreg Jig and attached it to the bookshelf. To finish I painted the whole piece white, and stenciled a tribal design on each side. It is so much fresher and cleaner looking now! I’m still deciding whether or not I’m going to keep the stencil or paint over it. We’ll see. At this point, it was time to tackle the bed. I had my heart set on building this West Elm inspired behemoth, using plans by Jen Woodhouse. It took about three weeks for me to finish, but it was well worth the time, and the entire thing only cost about $210. Up until this point, we’d had a queen set that just sat on the metal frame it came with; no headboard, no nothing. What a piece of garbage. Have I mentioned I am obsessed with our new bed? Once we had the bed set up in the room, it really dwarfed our night stands. I threw together a couple of taller ones to tide us over until we can find something a little nicer, and they turned out ok. I would really love some metal ones to contrast with the wood in the bed, but it can wait. I have one more semi-big project in the works, but other than that I think it’s time to call it on this makeover! I love finally having a grown-up bedroom (never had one of those before) that is relaxing and reflective of our my taste/style. Can I just shut the door and pretend the rest of the house doesn’t exist? What do you all think of my floral, granny-chic quilt? Yay or nay? I absolutely love this room al ! I love this! 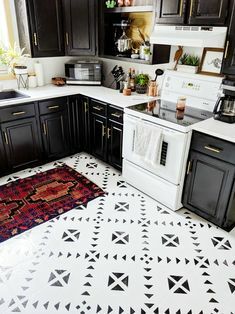 We have a kitchen floor to redo and I’m super tempted to try your idea! You did a fabulous job! Thanks Michelle! I have been thinking about doing these in the kitchen as well, but maybe painted instead? Be sure to share when you end up doing yours: I would love to see how they turn out! They look great. I’m actually waiting on a friend to help me pick up the last ten sheets of plywood (thankfully Home Depot cut each 4 x8 into 6″ planks with no extra charge). I cannot wait to start….all 800sq feet! Great job! That’s awesome, Wendy! Let me know how they turn out, and good luck!! This is a fantastic idea! And looks amazing!! What did you seal the plywood with once you were finished?? I have been saving plank floor DIYs for a while. I have to tell yours and one other one are by far the best I have seen! Your floors look great! Your DIY instructions were very easy to follow. Oh and I like your floral quilt its a nice pop of color in your room! That is so awesome to hear: thank you Texan! I love these floors and would recommend them to anyone looking for a cheap solution that still looks and feels great. 🙂 Let me know if you have any questions at all about them, I’d be happy to share any tips or tricks. Thanks for your lovely comment and for stopping by the blog. Love it! I so want to do this to our bedrooms. Thanks for the info and inspiration. Glad you like it Janet! Would love to see how yours turn out once you’re finished! I am thinking of the plywood floors for an entire home and have a couple questions. 1. Are you having any squeaking since you didn’t use glue? 2. Since you sanded before you installed, did you add a small bevel to the edges? The edges look square but I’m concerned that if any of the subfloor is not even that the final floor will have varying levels and create a mini ledge that may chip. Hi Jen! Thank you for the comment! I have not had any squeaking or creaking with the floors *yet*; it’s been about seven months now so they have had time to settle, but that isn’t to say they won’t start creaking in the future. I did bevel the edges. I wanted to make sure they weren’t sharp or splintery and so I just ran my electric sander across to take down the edges when I was sanding the planks before the install. I hope that helps! I honestly love the floors so much; even more than I thought I would. I love they way the look and especially the way they feel, which honestly was my biggest worry. Let me know if you have any further questions and good luck! I’d love to see them when you’re done! Allison, your one bad mama jama good job!! I agree with what Cris said completely! You are absolutely amazing! Bravo, keep it up and soon you’ll have an entirely new house. Thanks for sharing. Love love love this!! What TYPE of plywood did you use? I don’t mind some character but I’ve had some people say not to use anything soft….this is new to me. Also about how long did the process take start to finish? Just trying to allow time out if the house to dry. Hi Abby: I used the cheapest grade plywood they have (hence all the sanding) and it was pine. I can definitely see why people would have reservations using soft wood because it scratches/dents more easily but I have three dogs and the wear and tear hasn’t been an issue for me (see other comments regarding the “toughness” of the floor). Staining and clear coating was 3 days: Day 1, stain. Day 2, first clear coat. Day 3, second and third clear coat (once in the morning and the final at night). I used Minwax Ultimate floor finish which has a fast dry/re-coat time which was nice. After the final coat I think I waited one day before moving things back into the room, and didn’t put our rug down for two weeks or so. Good luck! Do things get stuck in the tracks? Easy to clean? We are considering doing this in our 550 sq ft mobile home that we will be living in for several months while we build 🙂 Thanks for your input! I love love love how it looks. Hi Molly! I get this question a lot, and it was certainly a concern I had myself before installing them. In a word, yes, stuff sometimes makes its way into the cracks but it is not nearly as bad/noticeable as I was anticipating. I vacuum once a week and honestly it keeps the gaps pretty free of dirt! If you’re looking for a cheap, wood flooring solution that looks great and wears fantastically, I think you should go for it! I stayed on the fence for a good long while and my only regret is that I didn’t do it sooner. I have zero complaints! Thanks for the comment and let me know if you have any further questions! Hey Allison! Quick question….have you had any problems with anything getting in the cracks between the planks? We are about to use plywood for our entire trailer and that is my only concern. The bed you built is just beautiful. Everything ties together so nicely. The floral quilt brings a touch of springtime and the white walls and plants with the light flooring makes the room so fresh, clean and airy. Thanks Nancy! The plans by Jen Woodhouse were so easy to follow and I am very happy with how the bed turned out!!! REALLY like the fresh fun feel in here. YES to Granny floral, are you kidding!!?? Way to add some fun personality! Love it with the more rustic headboard. And speaking of…could you link me up? Hi, I was wondering how you nailed your planks to the floor? I tried to look in the comments not to make you repeat but couldnt see… Nailgun? Screws? I read no glue thats all… Thanks for your answer…I have been thinking about doing it all over my 1000 sq feet rustic house… I want wood, no laminated, but I have a really tiny budget! One more question, you added no color? It looks whitish? Hi Melanie! If you search for the post where I lay the flooring it explains how I used a brad nailer to nail the boards into place. Hope that helps! This is gorgeous. I have a 16X80 mobile home I just stripped out. Now waiting to do all the floors. This is what we were thinking of doing as well. But gotta repair some holes first and get the ceramic tile laid down first in the 2 bathrooms. Sandy, thank you so much! They really have made a huge difference in the room and I love the way they look. No regrets! Good luck with your reno! I like how the flooring turn out. Planning to do that ourself. May I ask some questions? 1. Do you put moisture barrier in between the subfloor and the plywood? 2. We have MDF under the carpet, do I need to remove that or can I just glue and nail the plywood over it? 3. What is the distance between the nail do you use. I assume you used finished nails. Thank you in advance for your info. Look forward to start this project. 2. I don’t see why you wouldn’t be able to just attach the plywood to the mdf, as long as it wouldn’t add too much height for dorrs to close over, etc. 3. I just spaced the nails out about 12″ apart and used 2″ brad nails. I love your floors. I want to do this to my house. I hope I haven’t put it off too long and I’m not too old to do it now. I’ve always fixed or redone everything in my house. This looks like a l o n g project but not too terrible. Keep up the great work and sharing your success. Thank you Peggy — and yes you can absolutely do this! Let me know if you have any questions!